The Corsicana Cool Reflections 9620 is the top-of-the-line model in the Corsicana Cool Reflections line. It also has the softest feel with a Comfort Scale rating of 4.5, which is still considered medium-firm but provides a pleasing, mid-range blend of comfort and support. This mattress has a high amount of comfort materials for the price and is one of the best values in the memory foam category. The quilt has a thin design that allows the 2" Cool Reflections Gel layer to properly contour to the curves of your body, relieving pressure points to help you enjoy deeper REM sleep. The addition of gel is a nice touch as it helps the mattress have a more substantial, supportive feel. The 2" Cool Reflections Memory Foam layer adds additional softness and body contouring for side sleepers, and enhances long term durability. The 6" High Density Foam Core feels supportive and has the added benefit of transferring very little motion when movement occurs, which is invaluable for couples. 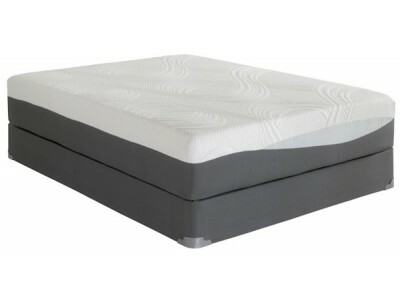 Overall, if you’re looking for a gel memory foam mattress that has an outstanding level of comfort for the money, this mattress is a great way to go. Its pleasing comfort level and overall support make it an excellent choice.